The multiplayer online battle arena genre, as it’s called, has generated plenty of interest from players and developers lately. The popularity of the Warcraft III mod, Defense of the Ancients has more than placed the genre on the spotlight as something that could be replicated and modified to tailor to the desires of various audiences. With so many games based around the genre being released over the course of the year alone, players now have the opportunity to find one that they’re comfortable with and Riot Games’ League of Legends offers a pleasing experience for both new and veteran players of the genre. 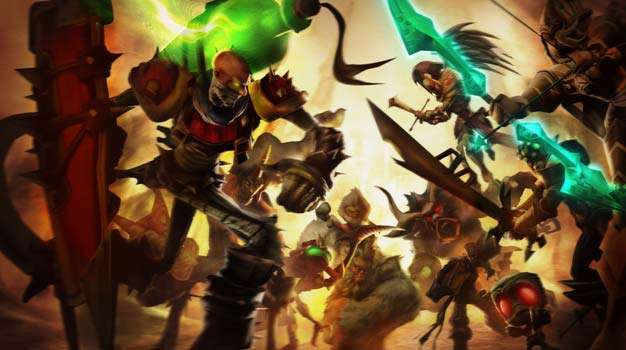 Developed by Riot Games, which includes some of the original creators of Defense of the Ancients, League of Legends has plenty of advantages right out of the gate. One important point that separates it from most other popular titles like it is the admissions fee. There is none. League of Legends is free game and in that regard, Riot Games impresses as the game shines with the polish of a game one would expect to have with a price tag. The game is feature-rich with tools ready for getting in touch with the community, matchmaking, several characters or champions as they’re known as, available to play and persistent ranking and character development. Add to this, the vibrant and stylish visuals keep League of Legends very reminiscent of the very mod it shares its foundations with but unique enough to keep players attracted for quite a while. 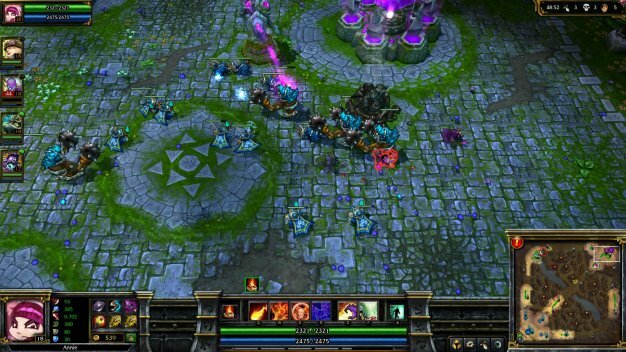 Like Defense of the Ancients, the foundation of League of Legends centers around an arena where a certain number of players must overrun an enemy base at opposite ends of the map. In League of Legends however, the player acts as the summoner, a powerful being that calls upon one champion to send into the arena. Each summoner must choose one champion and when the match begins, players are positioned at their bases in maps or Fields of Justice. The only unit the player controls is the champion and it is up to the player to purchase items from the store, level up and progress towards victory on the map. These colorful maps typically consist of lanes linking one team’s base to the other. All the while, computer controlled minions are released from the bases of both teams and players must use their champions to assist the critters and defeat the units of the opposing team. Pushing forward and hindering the defenses of the enemy team are crucial to victory, which is achieved by advancing straight into the enemy base and destroying the nexus. What if the player is new to the genre? New players also need not worry as the single-player of League of Legends acts as a helpful tutorial mode. 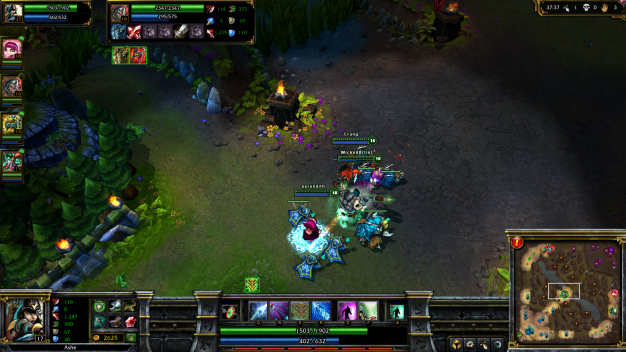 Using bots, the single-player introduces the basic elements and strategies of League of Legends. From assisting minions in ground control to engaging and avoiding towers at the right moments, the single-player is a great way of building up an understanding of the game and developing player awareness for actual matches. It’s quick and to the point, so it’s recommended that you spend some time in practice matches and get adjusted to team synergy and champion orders. The match itself will determine how wise the player’s pre-game choices were. Several things factor into every match that will keep players on their feet constantly. Players are given a set amount of money to spend at an in-game shop at the end of their base and in the shop players can go through several items that will contribute to their performance, ranging from items that increase health, mana and movement speed to adjustments to attack power and magic spells. While the amount of options in the shop may overwhelm some players, Riot has taken that into account and given players recommended options for each type of champion which are well chosen enough to keep players afloat. Almost anything that contributes to the progress of the match will count as experience and money towards the player’s champion, allowing them to level up. Eliminating minions, turrets or enemy players (especially when those enemy players are on a killstreak) will grant experience and sometimes money. Leveling up means upgrading the three initial abilities each champion has. At later levels, players will be able to unlock a fourth ability, known as the ultimate, which as its name suggests, is often crucial to use in matches at the appropriate moments. League of Legends is exceptionally reliant on teamwork but that doesn’t mean individual players won’t be able to show off how amazing they are. Whether you’ve destroyed a turret or an opposing champion, a match-wide notification and announcement will be made, allowing the player to bathe in the glory that comes with fighting in a Field of Justice. Matches themselves often last 20-40 minutes however, the ability of team to work together is critical in determining how fast matches end and though text communication is available, the option for voice chat would have been nice as well. The champions of League of Legends are incredibly varied, emphasizing the stylistic graphics of the game with some interesting twists to them. You have champions like Annie, who is a ranged attacker. Annie is a dark child with the voice of one too, always holding on to her teddy bear, even in battle. When the player levels up enough with Annie, her ultimate is the ability to unleash a giant version of that very bear, acting as her pet against minions and players alike. Other champions include characters that rely heavily on melee like Warwick. Each have their purposes on the Field of Justice and their appropriate uses. With that being said, the balance of the champions is substantial. While a few small modifications could be made, it’s nothing to get anxious about and no champion will have players groaning as soon as they see them arrive in the match. Take a step back from the actual in-game aspects and players have their respective summoner profiles. Persistent in their use and arguably just as important to take into consideration as the preparations before a match, players are given many different routes and options with their summoner profiles. 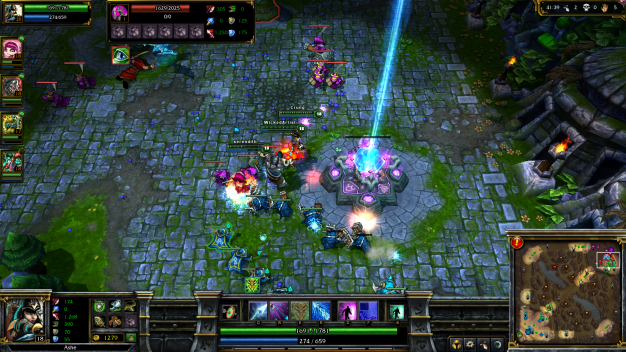 Every time a match is played, players gain experience towards their summoner allowing them to level up. Managing the summoner means picking mastery points, adjusting runes and unlocking abilities. Mastery points are used for skill trees that affect any champion the player will use. Divided into three general categories, players can choose to invest how they want in the offensive, defensive or utility trees. As players dump more mastery points into a skill, the deeper they’re able to go into that tree. Runes are primarily obtained through leveling (though they will be available for purchase through the store) and deal with (magical, defensive, or offensive characteristics. 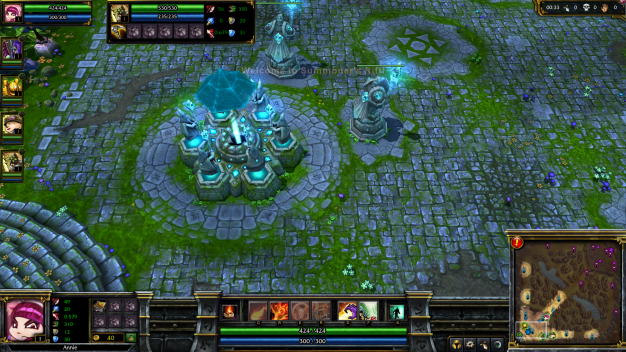 While mastery points affect all champions, runes are assorted through several Runebooks available to the player thus the player could have a Runebook tailored especially for casters, with health and mana regenerating runes while another Runebook would be made for melee champions, holding an emphasis on health, attack power and critical strike chance. The summoner system as a whole brings about interesting ideas that the player will have to consider when they are taking a break from the Field of Justice. The many benefits of advancing with mastery points and runes makes playing the game that more addicting. With that being said, League of Legends could benefit from a few improvements. In the case of the community features, though it is substantial in offering methods of communication in the form of a friends list and chat rooms, the absence of more in-depth options for competitive teams will cause some to have to use third-party options of organization. A replay or spectator system that would allow players to watch past matches would assist in learning the strategies of more experienced players as well. As a whole, League of Legends is one game that everyone who is interested should play. The level of polish is one aspect that Riot Games should be proud of. The stylish direction of the graphics make League of Legends are visually pleasing game to look at. The outstanding variety of choices in the champions will keep players occupied until they are able to find the ones they are comfortable with. While the gameplay itself remains unique to that of Defense of the Ancients, the game outside of the game itself in the form of the summoner will keep players coming for more. It caters to both sides of the playerbase, from the newest of players to the competitive players that want to try out a comp against another group of organized players. At launch, League of Legends remains a fairly complete package that should be played.